July 11, 2018, CALGARY /CNW/ - Painted Pony Energy Ltd. ("Painted Pony" or the "Corporation") (TSX: PONY) is pleased to announce results from two recent Lower Montney wells drilled on the northern edge of the South Townsend block. Preliminary results indicate production levels higher than Painted Pony management's Townsend type curve and include higher liquid yields compared to previous wells in the Townsend block. Painted Pony is encouraged by the results to-date and anticipates re-directing a portion of drilling activity within the existing 2018 development budget to better capitalize on these well results. Painted Pony drilled two Lower Montney horizontal test wells from a single pad to vertical depths of approximately 2,000 meters and lateral lengths of approximately 1,900 meters. These wells were completed using an open-hole ball drop system and a modified completion program. Static gradient pressure tests indicated that both wells were approximately 1.8x over-pressured. Both wells are currently pipeline connected to the AltaGas Townsend Facility. The first well, d-F57-H, averaged an estimated production rate of approximately 3,600 boe/d, 41% liquids, during the initial 24 hour test period of stabilized production flow. This production rate included 12.7 MMcf/d of natural gas and an estimated 1,475 bbls/d of natural gas liquids (85% condensate). The flowing pressure of the well during the initial 24 hours of the seven day test period was 2,800 psi through a 9/16 inch choke. During the final 24 hours of the seven day production test period the d-F57-H well averaged a production rate of approximately 3,000 boe/d (38% liquids) including 11.1 MMcf/d of natural gas and an estimated 1,140 bbls/d of natural gas liquids (83% condensate). The flowing pressure of the well during the final 24 hours of the seven day test period was 2,280 psi through a 9/16 inch choke. The second well, d-E57-H, averaged an estimated production rate of more than 2,300 boe/d, 39% liquids, during the initial 24 hour test period of stabilized production flow. This production rate included 8.6 MMcf/d of natural gas and an estimated 900 bbls/d of natural gas liquids (82% condensate). The flowing pressure of the well during the initial 24 hours of the 14 day test period was 2,300 psi through a 9/16 inch choke. During the final 24 hours of the 14 day production test period the d-E57-H well averaged a production rate of over 2,275 boe/d (38% liquids) including 8.5 MMcf/d of natural gas and an estimated 865 bbls/d of natural gas liquids (82% condensate). The flowing pressure of the well during the final 24 hours of the 14 day test period was 1,900 psi through a 9/16 inch choke. These production rates are higher than Painted Pony management's Townsend type curve. 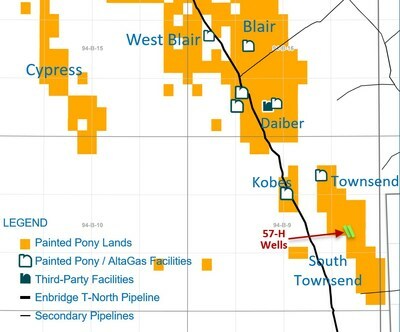 Increased overall natural gas and significantly higher liquids production rates position the South Townsend block to potentially deliver the strongest economics in Painted Pony's portfolio of properties. Painted Pony's South Townsend block is located on the southern block of the Corporation's Montney acreage in northeast British Columbia. Painted Pony expects to release second quarter 2018 operational and financial results after close of markets on Tuesday, July 31, 2018. Forward-Looking Information: This press release contains certain forward-looking information within the meaning of Canadian securities laws. Forward-looking information relates to future events or future performance and is based upon the Corporation's current internal expectations, estimates, projections, assumptions and beliefs. All information other than historical fact is forward-looking information. Words such as "plan", "expect", "intend", "believe", "anticipate", "estimate", "may", "will", "potential", "proposed" and other similar words that indicate events or conditions may occur are intended to identify forward-looking information. Forward-looking information is based on certain expectations and assumptions including but not limited to future commodity prices, currency exchange rates, interest rates, royalty rates and tax rates; the state of the economy and the exploration and production business; the economic and political environment in which the Corporation operates; the regulatory framework; anticipated timing and results of capital expenditures; the sufficiency of budgeted capital expenditures to carry out planned operations; availability of the AltaGas Townsend Facility; operating, transportation, marketing and general and administrative costs; drilling success, production rates, future capital expenditures and the availability of financing, labor and services. Undue reliance should not be placed on forward-looking information, as there can be no assurance that the plans, intentions or expectations on which they are based will occur. Although the Corporation's management believes that the expectations in the forward-looking statements are reasonable, there can be no assurance that such expectations will prove to be correct. As a consequence, actual results may differ materially from those anticipated. Forward-looking information necessarily involves both known and unknown risks associated with oil and gas exploration, production, transportation and marketing. There are risks associated with the uncertainty of geological and technical data, operational risks, risks associated with drilling and completions, environmental risks, risks of the change in government regulation of the oil and gas industry, risks associated with competition from others for scarce resources and risks associated with general economic conditions affecting the Corporation's ability to access sufficient capital. Readers are cautioned that the foregoing list of factors is not exhaustive. Additional information on these and other risk factors that could affect operational or financial results are included in the Corporation's most recent Annual Information Form and in other reports filed with Canadian securities regulatory authorities. These filings are accessible through the SEDAR website (www.sedar.com). Forward-looking information is based on estimates and opinions of management at the time the information is presented. The Corporation is not under any duty to update the forward-looking information after the date of this press release to revise such information to actual results or to changes in the Corporation's plans or expectations, except as required by applicable securities laws.